Utah’s iconic Rainbow Bridge hums with natural and human-made vibrations, according to a new University of Utah study, published September 21 in Geophysical Research Letters. The study characterizes the different ways the bridge vibrates and what frequencies and energy sources cause the rock structure to resonate. The vibrations are small, according to geology and geophysics professor Jeff Moore, but the study provides a baseline measure of the bridge’s structural integrity and shows how human activities can rattle solid rock. Rainbow Bridge, located in southern Utah, is a sandstone formation arching over a side canyon of the Lake Powell reservoir. At nearly 300 feet from the canyon floor to the apex of the arch, Rainbow Bridge is one of the highest natural bridges in the world. The site is also revered as sacred by five nearby Native American nations, and visitors are asked not to walk under the bridge out of respect. He and his team placed two seismic sensors on the bridge and two at a nearby location for reference comparison. 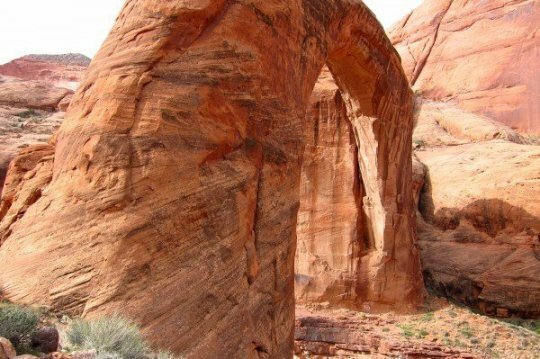 Moore had conducted similar studies on other rock arches, seeking to understand how arches vibrate and what kinds of vibrational energy can cause resonance in the rock structures. Every object, including buildings, bridges, and rock arches, resonates at preferred frequencies. If the object feels vibrational energy at its resonant frequencies, then the motion of the object amplifies the vibrational waves — sometimes to the point of damage. Resonant frequencies are well-known for human-made objects, but are more difficult to calculate for natural structures, such as Rainbow Bridge. The team recognized the rare opportunity to study the revered site. “We had a real respect for the bridge and the access we were permitted,” Moore says. Over two days of seismic monitoring in March 2015, the team identified eight major modes of resonant vibration — some forward and back, some up and down, and some twisting. Overall vibration of the bridge was a combination of those modes. Most of the time the bridge just shivered at a low hum. Several human-caused events contributed to resonance, however. Mode 1, for example, a forward and back bending motion, resonates at a frequency of around 1.1 Hertz — about the same frequency as the waves of Lake Powell. Vibrations from those waves travel through the rock and are felt in Rainbow Bridge. The bridge also feels earthquakes. During the study period, the team recorded three earthquakes (listen to one of them in the accompanying audio file). Two of the earthquakes were local, but one, likely an induced earthquake, occurred in Oklahoma — a testament, Moore says, that human activities can have unanticipated consequences. “Many things we do are actually felt by Rainbow Bridge, which is extremely remote,” he says. “Human activity has altered Earth’s vibrational wavefield.” It’s unclear what effect these low-level vibrations have on sensitive structures, or how they compare with natural vibrations caused by forces such as wind. “Recording that is an interesting outcome,” Moore says. While Moore’s team conducted seismic monitoring, Jack Wood of the National Park Service took photos of the bridge from countless vantage points, allowing the team to construct a 3D model of Rainbow Bridge that can be viewed here. From the model, the researchers were able to estimate the weight of the bridge at around 110,000 tons. According to Moore, that’s about the same as a Nimitz-class aircraft carrier or a large cruise ship. Moore says the team’s work is an impetus for further study of Rainbow Bridge, since so little is known about how vibration and resonance affect the health of the bridge. A repeated experiment would allow for comparison of the bridge’s vibrational modes with the baseline established in this study as a way to assess whether the bridge is undergoing changes. Web Source: University of Utah.